Lessons found in the borderlands of Israel/Palestine, Cyprus, and Northern Ireland. In early 2012, Kate Trenerry boarded a bus at the edge of the old city of Jerusalem. She was on a mission to photograph walls. One of those walls was the 430-mile-long Israel West Bank barrier, which cuts through the border town of Jabel Mukaber, dividing the Israeli and Palestinian settlements. The borderlands of Jerusalem were Trenerry’s first stop in a three-part journey to sites of past conflict and present divide. Next, the American photographer walked both sides of the U.N. buffer zone that divides the Greek part of Cyprus from the Turkish-Cypriot region in the north. She also traced the Peace Walls that separate the Catholic and Protestant portions of the Northern Irish cities of Belfast, Lurgan, Londonderry, and Portadown. She spent a month in each country and plans to collect the photographs, titled “Walking Walls,” in a book. “Outsiders tend to think of these places not as hot conflicts, but as sites of conflicts past,” Trenerry says. “Peace has been made, there are agreements in place: the Oslo Accords, the Good Friday Agreement, the 1974 ceasefire.” But aftermath, she says, is a whole different thing. “It’s hard work to maintain the peace—and foreigners aren’t interested, aren’t involved, aren’t funding it,” she adds. By the time Trenerry reached Belfast, her last stop, she was exhausted. Throughout her travels, “I was very often on edge,” she says. Most of the places she went, the people she had couchsurfed with refused to go; the memory of conflict pervaded the local consciousness in a way Trenerry says couldn’t comprehend. Trenerry and her guide took a hike up into the Mourne Mountains, a half an hour south of Belfast. It was a beautiful spring day, and when they reached a pass, they came across a barricade. 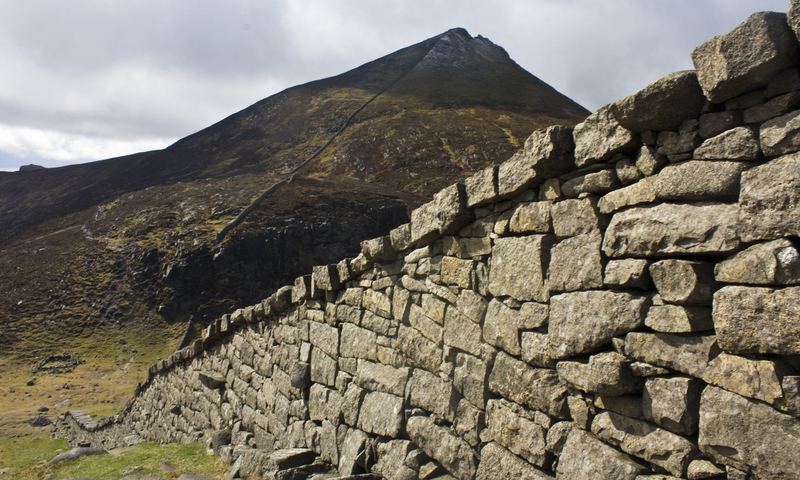 It was the Mourne Wall, built in the early 1900s to supply Belfast with water from the mountains. “It just reminded me: building walls is this ancient thing, and this one was so bucolic. Looking at it, it felt strange to me that we try apply these structures to such complex conflicts,” Trenerry says. Walls can be functional, necessary, even beautiful. But in the fraught political landscapes in which they are built (or threatened to be built), they both flatten and exacerbate conflicts; they cut off vital lines of communication and exist as physical reminders of divisions that have yet to be overcome. By walking the walls, Trenerry hoped to break those barriers down.